Do you know about Lightships? They were ships acting as lighthouses in waters too deep or in places where a lighthouse couldn’t be built. They marked dangerous moving sandbars, shoals, low water, a harbor entrance or mouth of a river. They could be moved around as a channel moved due to shifting sands. Lightships in America were utilized for 165 years: 1820 – 1985. A total of 120 stations were established on America’s coastlines and the Great Lakes. From 1820 to 1952 (when the last lightship was built), 179 vessels were constructed with wooden hulls and sail powered ships, to iron hulls with diesel engines. Lightship accommodations were not the best. These ships were placed where weather was horrid. The ships were tossed around so violently that even veteran seamen were frequently sea sick. Ewww. My stomach rolls thinking about that. The first true American lightship was placed off the coast of New Jersey to mark the entrance to New York Bay. The 90 long Sandy Hook Lightship was placed off Sandy Hook, and was in service between 1823 and 1829. Today only 17 lightships are left, mostly as museums with a few in private hands. Researching the Lightships I read many stories but for me, one was a stand out. The Lightship Nantucket. She was launched in 1930 and sunk in 1934. Rammed by the R.M.S. Olympic, a ship 74 times larger and…… sister-ship to the Titanic. On the morning of May 15, 1934 the Olympic homed in on the Nantucket’s radio beacon in a thick fog. 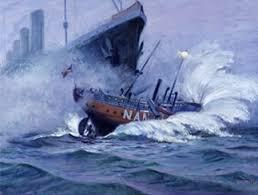 The Olympic had the lightship’s radio signal and fog signals and the captain of the Olympic changed course and speed. The Olympic felt she was well clear of the lightship, but, the Nantucket’s exact position wasn’t known—obviously. Yea. Clear like her sister ship Titanic and that ice berg. And just like in Titanic a lookout spotted the Nantucket dead ahead. The Captain did all he could but it was too late and she collided with the side of the Nantucket completely wrecking the smaller vessel. Olympic’s passengers who noticed a vibration came onto the deck to find out what was going on and were met by the smell of oil and the sight of debris in the sea around the ship. Those aboard the Nantucket felt a bit more. Newspaper reports say the crew saw the Olympic loom out of the fog less than 500 yards away and knew a crash was inevitable. Geeze. Can you imagine? Shivers. The crew put on life preservers and did the only thing they could, wait for the collision. Later the crew said the Nantucket was pushed and shaken and a horrible crunching and grinding sound was heard before she sank. Olympic lowered lifeboats and rescued seven of the eleven crewmen but three died aboard the Olympic. The lightship now rests about 200 ft deep, and is remarkably intact. It was discovered in the 1970s. It wasn’t identified until 1998.